I wanted to like Debutantes by Cora Harrison. I really did. The synopsis was incredibly alluring as was the cover. It was recommended for fans of Downton Abbey. I love Downton Abbey; the plot, the intrigue, the glamorous fashion sense and the inclusion of both upstairs and downstairs worlds. However, Debutantes fell very short of my expectations. 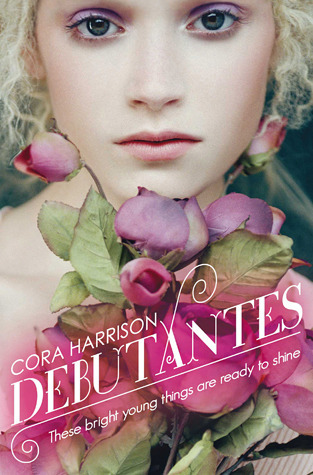 Debutantes is about four young sisters in the 1920s who have very little money to their good name. They live in a dilapidated manor house and haven’t enough money for the sumptuous food they were previously used to, cannot buy the fabulous gowns they see in magazines let alone provide their eldest sister Violet with a season as a debutante. Violet desperately wishes to be a debutante. It is all she has wanted to be. She sees it as her duty to catch the eye of a rich suitor and marry him. It will bring her peace of mind and will allow her to provide for her sisters. Daisy, the main character, her twin Poppy and Rose, the youngest sister, set about helping Violet in fulfilling her dream. It was difficult to get into Debutantes. At first it was difficult to tell the characters apart because they were all rather flat and were introduced in quick succession. I remembered the sisters by the difference in their hair colour which is never a good thing. Though Daisy was the main character and had a sweet disposition, I couldn’t help thinking throughout the book that Violet should have been the main character, even though I didn’t like her. Not only because Violet is the debutante which the book is named after but because Daisy is pretty much an observer and teller of Violet’s romance with Justin as well as telling us how Violet feels, looks and acts during various balls. On top of that, not much happens to Daisy. She acts as a barrier between us and the main action. I got tired of the amount of description I had to read of the clothes the girls were wearing every single time they appeared. The mystery surrounding, Elaine, the girls’ aunt was interesting though quickly sorted out. Overall, while Debutantes had an interesting premise, it disappointed me. I was a bit disappointed by this as well. I think it such such potential.